If there is one educational institution that features on these pages more than any other, it may be Cornell University. Every year we receive a pile of tips showing us the engineering term projects from [Bruce Land]’s students, and among them are some amazing pieces of work. Outside the walls of those technical departments though, we suspect that cool hacks may have been thin on the ground. English Literature majors for example contain among their ranks some astoundingly clever people, but they are not known for their handiness with a soldering iron or a lathe. We’re happy to note then that someone at Cornell who is handy with a soldering iron has been spreading the love. In the form of coin cell powered throwies that intermittently Rickroll the inhabitants of the institution’s halls of residence. We have few technical details, but they seem to be a simple affair of a small microcontroller dead-bug soldered to a coin cell and a piezoelectric speaker. If we were embarking on such a project we’d reach for an ATtiny of some description, but similar work could be done with a PIC or any number of other families. The Cornell Daily Sun write-up is more a work of investigative journalism detailing the perplexed residents searching for the devices than it is one of technical reference. We’re pleased to note that the university authorities have a relaxed attitude to the prank, and that no action will be taken against the perpetrator should they be found. Thus we’d like to take a moment to reach out to the Cornell prankster, and draw their attention to our Coin Cell Challenge competition. There is still time to enter, and a Rickrolling throwie would definitely qualify. This isn’t the first tiny Rickrolling prank we’ve shown you on these pages. Thanks [Simon Yorkston] for the tip. [Bruce Land] is no stranger to Hackaday as you can see from his Hackaday.io profile, if you aren’t familiar with his work [Bruce Land] is a Senior Lecturer at Cornell University. 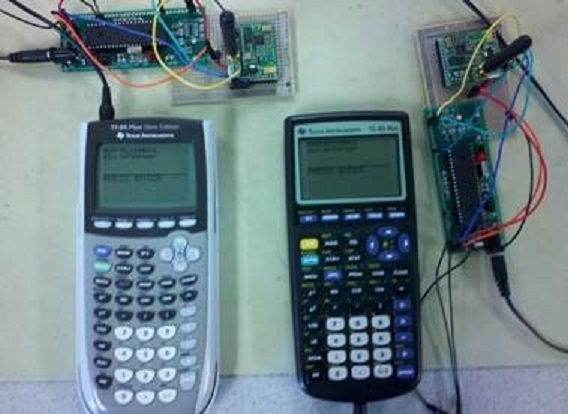 One of the courses he teaches: Digital Systems Design Using Microcontrollers (ECE4760) was recorded in 2012 and again in 2015 and the videos are available on YouTube. [Bruce Land]s previous set of ECE4760 lectures (2012) used an Atmel ATmega1284 AVR Microcontroller for the laboratory portion of the course. This means the lectures are also based on the AVR and if you haven’t watched them through a few times you should do. The recently updated set of lectures is based on the Microchip PIC32, more specifically the Microstick II. You can follow the ECE4760 rabbit hole as far as you want with all the available content provided by [Bruce Land] on his ECE4760 course webpage. You can watch the ECE4760 lectures on YouTube, try your hand at the homework assignments, and work through the labs at your own pace. One area that [Bruce Land] is unmatched and arguably uncontested is his shirt collection, we are continuously impressed with these original works and wish they were available for purchase (wink/hint c’mon [Bruce] throw us a bone!). If you don’t know why the rest of us aren’t able to obtain the wonderful shirts [Bruce Land] wears you clearly aren’t subscribed to [Bruce Land]s YouTube channel, you should rectify that wrong and log some ECE4760 lecture hours starting with the video after the break.